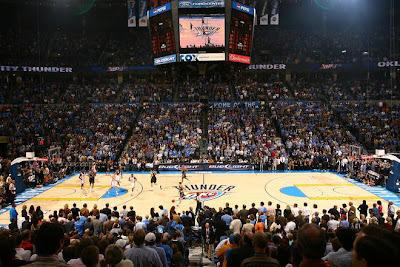 The crowd was set and the party was on as Oklahoma City anticipated it's long awaited debut as an NBA market. Fans showed up to Bricktown early to eat, celebrate the day and drink in the atmosphere of opening night for the Oklahoma City Thunder. They brought that electric atmosphere from the streets into the Ford Center for the historical tip off and then it was silenced by what could be described, at best, as horrific basketball. The Thunder started 2-for-12 from the floor and never led in the game. Kevin Durant was 0-for the first half and the Milwaukee Bucks led 50-35 at the half. If only the team had been able to match the intensity of the crowd. It’s always good when a team has great things to say about the crowd it just usually works better when the crowd has great things to say about team as well. This team has a new home and new fans (19,136 in attendance) but the same level of play we saw from them in Seattle. They struggle scoring from the floor (43% shooting, 16% from three) and they struggle with ball control (19 turnovers). Mix all of that together and you get a 98-87 home opening loss.